Maggie, the director of an amateur theatrical company, holds the hands of some distinctly mixed actors as they stumble through rehearsals for a new production. One of her new recruits is Martin, a middle-aged accountant – recently dispossessed of his job and his wife, he's in search of some small success in life. 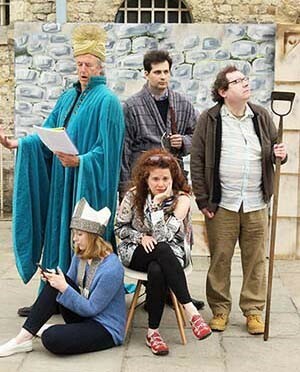 The play-within-a-play tells the tale of an ancient power struggle: on the one hand, the dissolute inhabitants of a mouldering abbey, on the other, the scheming Veiled Lady and her retinue, who have occupied a nearby castle. For Martin, in the reluctant rôle of an elderly monk, acting proves to be no escape from drama and affairs of the heart. Will the cast pull it off? Who is the mysterious Veiled Lady? Can piety defeat military might? Whither the Cavalcade of Fools? This new play by Andrew Barsby is a joyful investigation into love and hate, war and peace, the perverse splendour of human relations and the sheer unreliability of Fate itself.